We’re less than two hours away from President Trump revealing his Supreme Court nominee—and red state Democrats decided to head for the bunker. Okay—not exactly fair, but they declined an invitation to the announcement set for 9 P.M. tonight. Sens. Joe Manchin (D-WV), Heidi Heitkamp (D-ND), and Joe Donnelly (D-IN) were all invited and all declined. 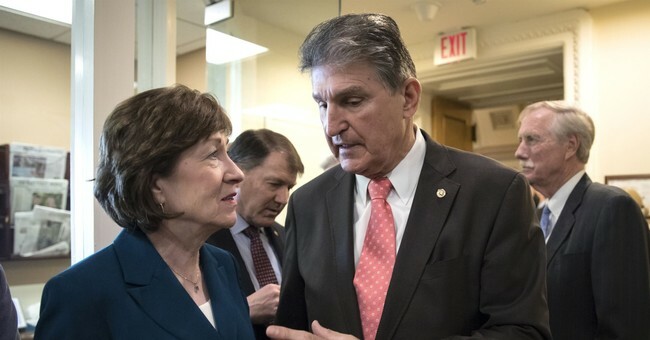 Sen. Susan Collins (R-ME), someone who could give Senate Republicans trouble should she defect, also declined to attend. Guy has been following the SCOTUS crumbs all day and it’s been a seesaw. As of now, his sources say that it’s probably going to be Judge Brett Kavanaugh, who is on the D.C. Court of Appeals. Yet, there’s also Judge Amy Coney Barrett of the Seventh Circuit Court of Appeals and Judge Raymond Kethledge of the Sixth Circuit Court of Appeals. Thomas Hardiman of the Third Circuit has also been floated. Source just called w/ two pieces of circumstantial evidence, both strongly pointing to KAVANAUGH. Intriguing data points, but not 100% solid. Asked another good source by text if he could confirm...”unable.” Other sources have gone dark. If it’s not Kavanaugh, the deliberate misdirection going on is next level stuff. Whoever it will be will bear serious pressure on red state Democrats running for re-election this year. If they vote for the Trump nominee, they can detonate a lot of GOP attacks to come their way, centered on the being Schumer-Pelosi lackeys, but they’ll also be ostracized from the national party. They could also get attacked from progressive groups. If the vote against the nominee, well, for some—it could mean the end of their careers in public life. Sen. Claire McCaskill (D-MO) certainly knows what’s coming her way. Red state Dem @SenatorHeitkamp was ALSO invited to WH #SCOTUS announcement, but will no be able to attend, per spox. WH invites GOP ME Sen Susan Collins to attend SCOTUS announcement. Collins’s office says she “appreciates the invitation, but will not be attending." With zero hours approaching and Barrett and Kethledge reportedly out, will it be Kavanaugh? Or will this be a head fake, given that Trump knows how leaky his White House is. We’ll find out soon, but the aversion to provide space and hide in the bushes tonight from vulnerable senate Democrats shows they know the stakes. Some of who might be chiseling their political epitaphs as we speak. Amy Coney Barrett is out, per Sen. Orrin Hatch (R., Utah) who said he has a "pretty good idea" of who the SCOTUS pick is. "I don't think she's going to be the one who is chosen but I think she will be next time," he said.